The characteristics of internal combustion type rotary kiln is good calcination quality, large output capacity, long service life, energy saving and environmental friendly. The complete set of equipment has high mechanization, so it can realize auto control. The dryer can be used to dry, crush, screen and convey materials. The fuels for rotary kiln vary on combustion device. The smoke can be recycled by the tail gas treatment system. The combustion way is internal. Directly burn the coal, gas, smoke or natural gas as heat source. The molybdenum sulfide contains 5% moisture after drying and then will be sent to the rotary kiln for oxidizing roasting. The calcined molybdenum oxide will be discharged from kiln tail. 1. The sulfur residual in molybdenum oxide meet the standard requirement. 2. The output capacity can be 2000 t/y for a single kiln, and the service life is 5~10 years. 3. Less coal consumption per ton of molybdenum oxide, 400~450kg. 4. 99% of tail gas can be recycled. 4. 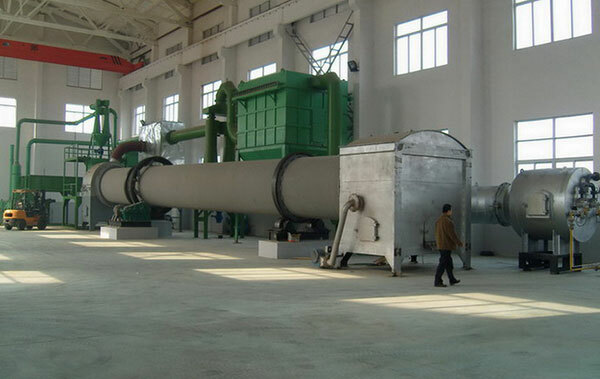 Tail gas recycling method: bag type4 dust collector.